It was in the year 1844 that the Borough Council first discussed the possibility of a rail line linking Lymington to London. 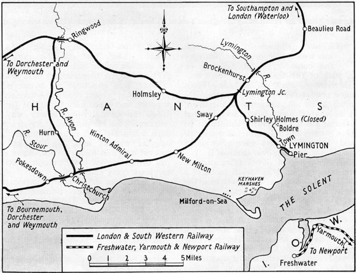 Charles Castleman, the principal director of the Southampton to Dorchester line which was linked to Brockenhurst, approved the idea. However no firm decision was made. The idea lapsed and it was not until 1856 that the Lymington Railway Act was passed. Railway mania was waning but local businessmen were still prepared to finance the line and £21000 was raised. Over 4 miles of single track line, 4feet 8inch gauge with three bridges and two level crossings, was constructed by 100 navvies in less than a year. A toll bridge, town quay and ferry were part of the scheme. The site designated for the station consisted of a deep mill pond and while this was being drained a temporary station was built near Bridge Road. The Town Station with its red, blue and white bricks, three handsome gables and a waiting room for each class of passenger was opened in 1860. The first train ran on 9th May, 1858, with V.I.Ps and guests scrambling aboard to enjoy the journey via Tuckermill Copse, Passford Water, Milking Pound Bottom and Setley Plain. However, the Board of Trade insisted that the line had to be strengthened so the official opening was delayed until July 12th. As there was no turntable to turn round larger locomotives, tank engines such as No.143 Nelson and No. 176 Southampton were used. The journey time to London was cut to four hours and soon the line was included in Bradshaw’s Railway Timetable and the postal distribution map. One of the first Halts in the country was Shirley Holms which consisted of a short platform with no buildings or staff. It wasn’t on the timetable and there were no tickets. Residents of Boldre and Sway stopped the train by raising their hands. Shirley Holms closed in 1888 when Sway had its own station. In the late 19th Century, excursions became popular especially with the excitement of a ferry trip to the Isle of Wight. 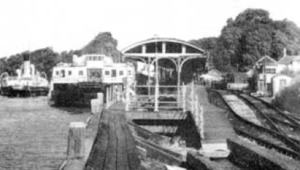 However, because of tides, passengers sometimes had to walk from the station to the jetty to be rowed over to the paddle steamer or even had to scramble over the vessels bringing in coal and slate. In 1884 the track was extended to the deeper water of Lymington Pier, carried across the river on a 64m long iron viaduct of ten spans. A tunnel under the Solent from Lymington to Yarmouth was proposed in 1901 but was never built. 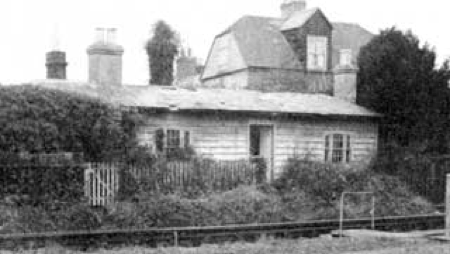 The station at Brockenhurst authorised in 1847 as part of the 11 mile line linking Brockenhurst to Christchurch was no longer adequate when the Bournemouth Direct line was built and in 1886-1888 had to be modified. A new ticket office was constructed and waiting rooms which were decorated with photographs donated by Julia Margaret Cameron, a regular traveller. There were now ‘island’ platforms with cattle pens on one side, the Lymington line on the other and a swing bridge for parcel trolleys. In 1914 the branch line was taken over by the government so that soldiers, Commonwealth casualties and armaments could be conveyed to and from ships on the Solent. To cope with holiday traffic in the 1930s Class M7 tank engines were introduced and the Pier was rebuilt to accommodate double-ended car ferries. Services were again cut back in 1939 and only local people or those with special permits were allowed to travel. 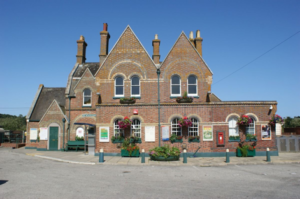 The roof over Lymington Station was partially destroyed by bombs and an air-raid shelter was built. As the troops gathered ready for D-day, a senior American officer was so horrified by the meandering single track that he demanded that a new railway should be built in a straight line ‘starting Monday’. The track remained and, after the war, service was quickly restored though the London trains were limited to ten corridor coaches. Sometimes there was a locomotive at each end saving time by having no need for uncoupling. A scholars’ train conveyed pupils to and from Brockenhurst Grammar School and there was a daily freight train carrying coal, corn, cement, livestock and goods for the shops. In 1956 a Halt was created at Ampress for the benefit of workers at Wellworthy’s Ampress factory. The 7.04 from Brockenhurst picked up 200 nightshift workers. This facility ceased in 1989. 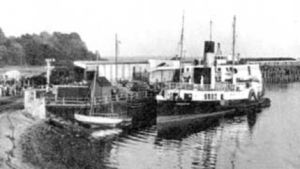 Car ownership was increasing and in 1938 the car ferry ‘Lymington’ was introduced to be replaced by ‘Freshwater’ and ‘Farringford’. By 1955, 42,000 cars a year were being carried from Lymington Pier to Yarmouth. Yet nothing was done to modernise the railway line, which continued with its M7 tank engines even as its market decreased. The unprofitable Lymington to Brockenhurst line was designated as a ‘social’ passenger line. It was the last steam-worked branch line on British railways but needed to be modernised .The last steam train left in 1967.The line was electrified, the station was restored, reliability of service improved, discounted fares with a Network Card were introduced together with a red, white and blue livery scheme. In 1978 Lymington Junction was closed and the Lymington branch now runs along its own separate line into Brockenhurst. In 1992 the viaduct was stabilised with 300 tons of rock. A year later the track became the responsibility of Railtrack while the rolling stock, stations and maintenance were leased to SW Trains. With an emphasis on conserving the environment, financial performance and social value of local railways, in 2004 the Strategic Rail Authority launched the Community Rail Development Strategy. South West Trains supported the concept of a heritage line which would provide an additional tourist attraction, would be responsive to local needs yet would still maintain current service frequencies and connections to the ferries and mainline services. They made use of Class 421 slam-door trains. The Lymington Flyer had three carriages refurbished to address the height difference between the train and platform at Lymington Town station. The establishment of the Lymington to Brockenhurst Community Rail Partnership made the line more secure than ever.